Twelve beautiful minutes, composed of 13,375 frames that were in fragments when they were discovered in 1993. The restoration of the hand-tinted version of Georges Méliès' A Trip to the Moon (1902) is an artfully composed wonder of technology and skill. I have noticed things in this version of the film that I have never been able to make out over the many years that I have watched it. Things like the faces on the moon medallions around the necks of the celebrated space travelers when they return to earth and the bolts on the space ship as it is built in a busy shop. The colors are rich, but also subdued. They enhance their surroundings rather than dominating them. Though the film has been reconstructed from fragments and the images sharpened, the restoration team has also respected the character of the original creation. For example, they had the technology to even out the color, but chose instead to mimic the characteristics of the paint brushes that were originally used to color each frame of the film. So instead of a constant stream of color, it begins to fade in some instances, just as it would when a colorist’s paintbrush began to run out of ink. It is this kind of attention to detail that lends an air of reverence to the restoration. One notable aspect of the restoration is the soundtrack composed by the French band Air. As there was no original score, the filmmakers had to start from scratch. The selection of this simultaneously ethereal and earthy group had me skeptical at first (despite the fact that they are one of my favorite groups), but not for long. It is a timeless soundtrack, meant to last for a hundred more years. By combining appropriately spacey keyboards with more classic sounds such as banjo, piano and timpani, Air has created an ambitious, but excitingly catchy score. I now find it impossible to erase it from my mind when I watch an unrestored version of the film. I’ll write more about that when I review the soundtrack album tomorrow. A lot happens in the few minutes that make up this mesmerizing film. A scientist (played by Méliès) attempts to sell his colleagues on his plan to make a trip to the moon. He wins them over, and workers begin construction of a space ship. With great fanfare, the ship is launched into the sky with cannon that appears to extend practically to the heavens. It careens into the eye of the lady in the moon, yes a lady, played by musical hall singer Bleuette Bernon. She takes it with good humor. The space travelers look back at the earth, far away. They settle down to rest, and while they sleep, the heavens gaze down upon them. A snowstorm wakes them, and they attempt to escape it by going beneath the surface of the moon. There they find a bizarre, magical landscape and meet a menacing moon man who bounces around on his bottom. They are captured by more moon men and taken to their leader. Within moments, the space travelers escape. They run to their ship and hurry inside. As they leave the moon, one of the aliens clings to the ship. The ship crashes into the ocean. Upon their return to earth, the space travelers are honored in a joyful celebration. They are given moon medallions to wear around their necks, and dance in the streets. It even appears that the now captive moon man is dancing along with them. It always amazes me that all this activity happens in only twelve minutes. The prescience of some of Méliès’ speculations is also astounding. While real astronauts don’t wear knee breeches and carry their umbrellas on the surface of the moon, the way they were shot into space is not too different a concept from the modern shuttle launch pad. The water landing is also reminiscent of actual landings. While it is a playful work of fantasy, the eerie accuracy of the speculation gives it a little more substance when viewed with a modern perspective. The special features on the disc enhance the film delightfully. 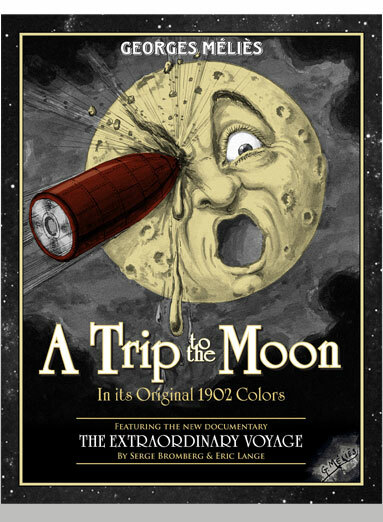 There is a charming documentary about Méliès and the restoration, The Extraordinary Voyage (2011), which I reviewed yesterday. Other features include two space-themed Méliès films: The Eclipse (1907) and The Astronomer’s Dream (1898), which are also inventive, if not nearly as ambitious. I was happy for the inclusion of an interview with Air; their explanation of their working methods and intended effect helped me to better understand and appreciate the soundtrack. 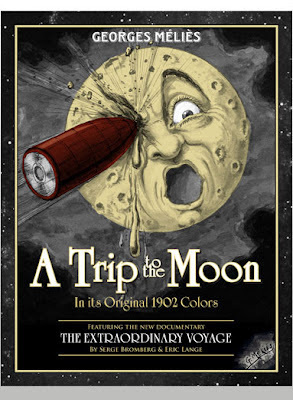 Another interesting feature was the inclusion of three black and white versions of A Trip to the Moon (1902). Each of these clips was meant to approximate the different ways viewers might have seen the film upon its original release. One version simply has a score. The other includes a narration from a script written by Méliès. A third version consists of actors reading lines to correspond with the action on screen. Apparently this last method was executed in the theater by having the performers stand behind the screen while the movie played. Overall, this is a beautiful release. With every detail it is clear that it was prepared by people who deeply love the film. It would be a precious treasure for anyone who reveres Méliès and his masterpiece. Tomorrow: I review the soundtrack album by Air.